The following children’s Bible lesson on life outside the garden will help children to understand more about the consequences of sin. 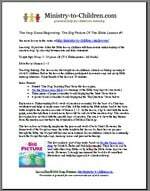 It continues a children’s church curriculum based on &utm_medium=blogpartners”>The Big Picture Story Bible. These children’s church lessons can easily be modified to serve as children’s Sunday School lessons. These kid’s Bible lesson are offered as guides for your own teaching. Be sure to modify the content to best fit the children in your ministry. Learning Objectives: After this Bible lesson, children will demonstrate understanding of the results of the fall, by choosing between true and false statements. Teaching Setting: This lesson was first taught in our children’s church on Sunday morning to about 25 children. Before the lesson the children participated in several songs and group Bible memory exercises. Target length of this lesson is 20 minutes. Printed “One Page Teaching Plan” from this lesson plan. You can more lesson plans about Noah’s Flood from Calvary Chapel Kids, eBible Teacher and ChristianAnswers.net. Explanation: After humans rejected God as their king, the world became a terrible place to live. This lesson deals with the consequences of the fall, especially God’s judgment upon sin. While this can be difficult to teach to small children, it is essential that kids learn the truth about our world. This will prepare them for hearing the good news about Jesus. God’s judgment is his good and right punishment for our sins. In this story the Flood is presented as a worldwide act of judgment upon mankind outside the garden. It was good and right for God to unmake everything that he had made because it was fighting against him. But we can see God’s love in his saving Noah and his family. This lesson plan is part of my series based on The Big Picture Story Bible by David R. Helm and Gail Schoonmaker. These lessons can be used with other story Bibles or by telling the Bible stories in your own words. However, I strongly recommend this book for it’s excellent illustrations and unifying approach to salvation history. Active Listening: Say, “Please listen carefully while I read our Bible story. When I’m done I’ll ask some questions to see how well you understood the story.” The questions under “review” below are the key points for them to understand from the lesson, so be sure to emphasize them as you read. Read: “Part 3” from on The Big Picture Story Bible. (Or tell the story of the Genesis 4 – 10 in your own words emphasizing the answers to the questions below.) Be sure to engage the children with good story telling. Ask unscripted questions to clarify points in the story. Be sure to explain the concept of judgment. See “Explanation” on page one of this lesson. Review: Call on volunteers to answer these questions from the story you just read. Some possible answers are written as italics below. What was life like outside the garden? It was terrible. Everything was hard. Everyone turned away from God and ruled the world in evil ways. Everyone doubted God’s goodness and disobeyed his word. What did God decide to do about all the bad things people were doing? God sent a big flood to punish them. Who did God save from his flood punishment? God saved Noah and his family and many animals that lived on the land. What does God’s judgment (punishment for sin) teach us? It teaches us that every single person needs God’s blessing. Because we are sinners, we deserve God’s punishment and need God to save us. True or False: Ask the children to choose which of the following statements are correct. If the statement is correct they should stand, if it is false they should remain seated. Do You Know: Say, “In the story we learned that all people need God’s bless, does anyone know how God was going to bless all people?” Call on volunteers to answer. This is a good point to talk about Jesus coming to remove the trouble caused by sin and put people back into a right relationship with God. Need more help? Check out these Sunday School crafts and Sunday School lessons. Or learn how to write a Bible lesson.